If you’re looking for an eco-friendly vehicle that can not only stand up to your everyday needs but exceed them, then you’ve come to the right place! The 2016 Toyota Prius is an option that can’t be missed. It’s impressive low emission rating and affordable price tag make this quality Toyota a viable option for the entire family. Looking for a commuter car? You’ll be hard pressed to find one with better fuel economy. How about a rugged trip up the mountain? Don’t let the Prius fool you, it can handle those needs as well. Let our experts help in your quest for a Toyota complement, start shopping online today using our convenient online inventory system. There you can scroll through the different options available and even schedule a test drive! Prefer a more hands on experience? We can take care of that as well, stop by our Toyota dealership to have a team member walk you through the different features of the Prius and see what suits you best! We’re standing by, eager to tell you all about the 2016 Toyota Prius. When you purchase any Toyota, you can rest assured your safety needs are being well cared for. Our ToyotaCare is just one of the many ways we show our customers that their security is a top priority. The two year/25,000 mile maintenance plan gives you an added layer of protection while the Star Safety System that comes standard on 2016 Prius models includes a slew of features that work together for your safety. Talk to an associate about the Vehicle Stability Control or the Anti-Lock Brake System and how it can benefit your driving experience. The Smart Stop Technology is there for you, paying attention in the rare cases that something else has preoccupied your mind. Research is vital when shopping around for a new vehicle, but nothing can replace the test drive! It’s a great way to experience the car for yourself and see if it is capable of satisfying your Florida needs. The integrated back up camera will guide you out of those tight parking situations while the Rear Cross-Traffic Alert will send an audio signal for approaching obstacles, keeping not only your passengers safe, but those around you. Add on the available Blind Spot Monitor to help you keep track of all those other vehicles on the road as you change lanes! When night falls, have no fear, the optional Auto High Beams will illuminate your route and are capable of switching themselves off when a vehicle approaches. In this way, the Prius doesn’t only look out for your safety, but the safety of all. Ready to start customizing your Prius? Talk to an associate about the impressive add-on features, like the Pre-Collision system that wouldn’t be complete without the Pedestrian Detection. Ask about the radar cruise control in which you can set many different factors, not just your speed. Imagine driving down the road using the cruise control when another vehicle cuts into your path. Instead of having to quickly react and slow the car down, the Prius will use your predetermined car following distance to automatically slow the vehicle down. When the obstacle clears, the Prius will speed back up to your original cruise setting. Combine that with the Lane Departure Assist and gentle Steering Assist, and this car practically drives itself! You’ll wonder how you ever got on without it. The 2016 Prius has a jaw-dropping aerodynamic design that cuts through the wind, only adding to its already impressive efficiency. Not only does this style reduce any resistance, it helps to create a quiet interior cabin delivering you peacefully to your destination. We’re here to provide you with a multitude of options, so talk to our team about the different trims and fuel economies of each. We can listen to your driving habits and present a few viable choices as well as some helpful add-ons. We’re standing by, eager to help you find a Prius that suits all your needs so give us a call now or come by our Florida dealership! The moonroof will make you feel you’ve inside an eco-friendly ride and the steering wheel controls will help sooth you, keeping your attention on the road. Customize the 4.2-inch display screen to show you the pertinent information of your choosing. The eight way power-adjustable seats will provide breath taking lumbar support so those aching muscles are a thing of the past. Turn on the LED headlights and hit the road on the 17-inch alloy wheels to slide effortlessly over the pavement. The Prius doesn’t only provide for your safety, the luxurious technological features aid in your driving comfort. The Intelligent Clearance Sonar can assist with any reversing situation by scanning the area and alerting you to any objects you’re not able to see. Don’t react in time? Don’t worry, the Prius can automatically apply the brake for you. If you frequently misplace your keys, ask about the Smart Start technology where you can power up your Prius with the push of a button. The Entune Premium Audio is available for all those music lovers out there and the Heads-Up Display will make you feel like you’ve just stepped inside of an airplane cockpit. Turn up the smart-flow climate control to keep all your passengers comfortable during those long hauls. Come by now to hear more details or to experience these features for yourself. The Prius comes with some impressive cargo room so you can take that much anticipated camping trip or head out for a complete grocery shopping endeavor. If you find you’re running low on space, the 60/40 seats will come to the rescue! Now you can lay one or both sides down, depending on your needs, giving you that extra space! The Prius has many different compartments inside the vehicle as well, so rest assured that all your storage needs will be meet. Don’t get caught up in a tangle of wires, check out the available Qi-compatible wireless smartphone charging surface to keep a full battery on all those important devices! We look forward to serving all our Florida customers, and invite our Bradenton, Port Charlotte, and Punta Gorda neighbors to stop by our Toyota dealership. We can assist you in not only your new car purchase, but can answer those finance questions and keep your Prius running smoothly with our onsite service department. 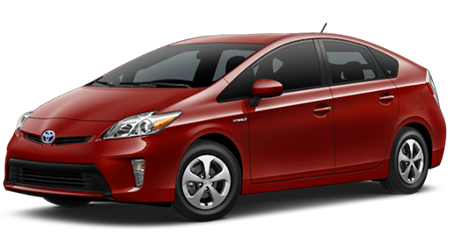 Give us a call today to secure your very own 2016 Toyota Prius!